What’s Wrong With The Brexit Campaigns ? Readers outside the little islands of the UK may be only dimly aware that the British have been enduring months of wall to wall media coverage of two very uninspiring and increasingly fractious campaigns, to ‘leave’ or ‘remain’ in the European Union (decision day is 23 June). 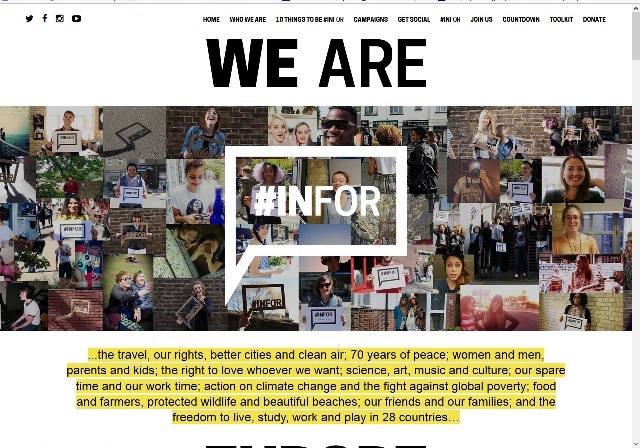 As well as generating a lot of popular boredom, this has much excited the political classes (perhaps about 2 – 3% of the population) and recently, stimulated a lot of less public discussion amongst professional NGO campaigners, most of whom are ‘remain’ supporters deeply frustrated with the way the campaign has gone to date. Like most campaigns and especially political campaigns, the ‘debate’ is a tangled mixture of communications designed to work by Kahneman’s System 2 (the hard, analytical weighing of facts and so on) and the easy, dominant System 1, the intuitive, also known by less admiring terms such as emotional, knee-jerk, dog-whistle, prejudice and animal instinct. In other less contested areas of life it’s also known as marketing and advertising. That’s’ just the design of communications. In the tumult of a long running campaign made up of two sides united only by increasing dislike of one another but each composed of an alphabet soup of supporters, it is very likely that most of the communication just happens and very little is that well controlled. What About The Facts ? A recent UK newspaper headline read ‘EU referendum: British public wrong about nearly everything, survey shows’. The ‘everything’ in question included numbers of immigrants, the economic costs and benefits of being in the EU and a lot of urban-myths about EU regulations concerning things like the shape of fruit. “At the bottom of all the tributes paid to democracy is the little man, walking into the little booth, with a little pencil, making a little cross on a little bit of paper—no amount of rhetoric or voluminous discussion can possibly diminish the overwhelming importance of that point”. As any pollster knows, if people are confused or facing the challenge of processing a lot of hard to verify or difficult-to-understand information, and you then ask them if they’d like ‘more facts’ or if they feel ‘well-informed’, they are likely to say no they are not well informed and yes they would like more ‘facts’. This is what Kahneman calls substitution: replacing the hard System 1 analysis with the easy System 2. ‘More facts’ becomes ‘better facts’ and that invariably means fewer but more satisfying facts. So it’s not really a desire for more information they are expressing, rather a desire for an easier way to make a decision. The dilemma is that the decades long EU-UK relationship is similar in complexity to that between a husband and wife or the UK and the rest of the world. More information about that makes it harder to decide, not easier, unless that information aids the Substitution process by reinforcing a heuristic decision that can be made with System 1, for instance “who is in favour and who against ?” or “how do I feel about it ?” (affected by values, experience, behaviour and so on). Knowing that viewers, readers and listeners are switching off when they see yet another sample of politicians shouting factoids and soundbites at one another, most UK news channels have by now resorted to debates of carefully selected audiences and a lot of ‘provision of facts’ as the basis of their coverage. Arguably they have little choice but providing ‘facts’ is also the safe ground, avoiding such cans of worms as why values explain so much of the pro and anti EU divide, or the insights of psychologists like Kahneman into what’s really happening when the ‘little man walks into the little booth’. By concentrating on being facilitators of informed and ill-informed debate and throwing in dollops of ‘information’, the media also avoids getting drawn into awkward questions such as the behind-the-scenes influence of Euro-sceptic funders who are intimately connected with Climate-sceptic groups. 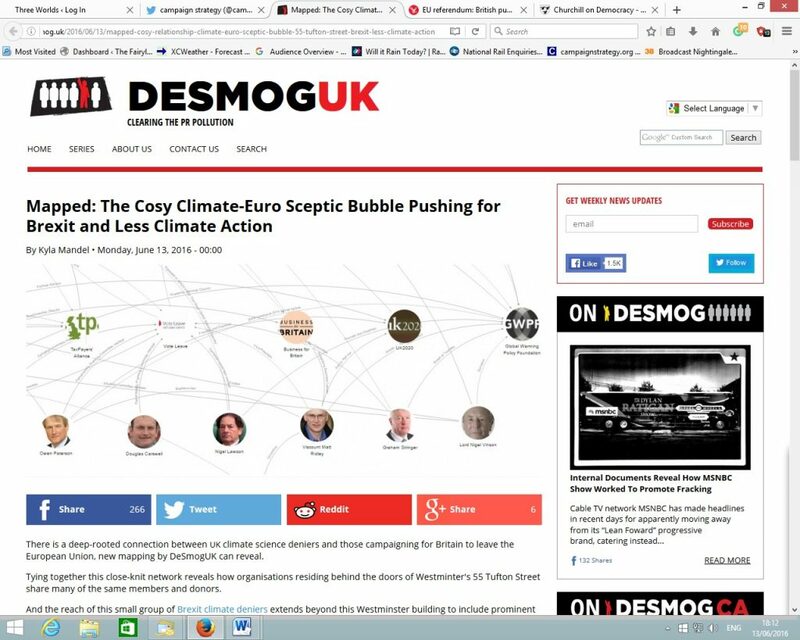 A remarkable new study (June 13) by www.desmog.uk shows the network of links between anti-environmental, climate-sceptic bloggers and institutes, and the pro-Brexit leave campaign. ‘The overlap stems from a common neoliberal ideology that fears top-down state interventions and regulations which are perceived as threatening values of individual freedom, economic (market) freedom, or the sovereignty of national governments. Under this logic, we must reject both the European Union and most climate policy. Not a hard question to answer, and one reason why environment professionals and the UK’s larger environmental NGOs such as Greenpeace, Friends of the Earth and the Wildlife Trusts all came out in favour of staying in the EU, and after some weeks of equivocation, were finally joined by WWF and RSPB (see my updated blog on green groups and Brexit here). What About The Campaigns Then ? 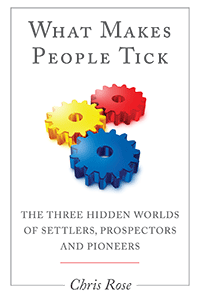 I’m in favour of Remain and in a previous blog on the Brexit Values Battle I suggested that the Remain campaign would do well to try and attract more active support from the Prospectors and in particular, the Now People. In short the Remain campaign has been somewhat dull and lacking in any sort of fun, positivity, or convincing optimism. Now People are hugely influential but seek success and having a good time. Any brief to engage them with the rather passive idea of ‘remain’ (which sounds a lot like stay where you are, not a very Now Person idea) has to be about having a better time being in Europe, than if we go out. The benefits of Euro-railing, enjoyment of foreign holidays, making friends and having a good time doing business with Europe, and the endorsement of celebrities for the same, are likely to have more effect on this than any amount of ‘economic argument’. The same could be said of shopping. Think of all those EU brands and retail experiences: however hard it tries, almost any British city will struggle to compete with a weekend in Barcelona (travel visa free in the EU), or Milan. (For some good Now People campaign engagement look at the Greenpeace Detox campaign discussed in this blog). Plus although Now People are motivated to work hard and to be optimistic about the future, as that’s where they are going to really succeed, you need to talk to them about life outside work. Earning money is after all about being able to play hard too. Hearing again and again why the Leave campaign is wrong about this or that on economic policy or immigration (which the Now People are far less bothered about than the Golden Dreamer Prospectors or the Settlers), is all pretty drab grey fare and not exactly conducive to a good night out. Now People are more likely to see a good time as being a festival or club than in a pub with Nigel Farrage but being seen downing a pint or two on a regular basis and being a smoker will give a lot of Settlers the impression that he like them would be happy to wind back time. Farrage plays the Settler even if he isn’t one, and does so convincingly. The Remain camp has had no such Now Person spokesperson walking the walk. Probably the best effort is http://weareeurope.org.uk/ which has a much more positive tone. The Now People want to wind time forwards – ‘Remain’ despite its name, needs to show that’s what being in the EU will be all about. Modernity and opportunity and a better chance of success, at work and play. Taking the Eurostar to Paris rather than the A12 to Clacton. The Remain camp leadership has made no noticeable attempt to communicate anything about what makes it enjoyable to be in Europe, to remind people why they like it (by people I mean those leaning towards staying in but who are undecided or may not vote) or to equip their followers with arguments and evidence about what is good about the EU in personal, family and human experience terms rather than macro-economics. On top of that as others have pointed out, they spend much of their time trying to rebut claims of the Leave camp which are designed, dog-whistle-style, to whip up fears over immigration or ‘control from Brussels’. These are Settler-Golden Dreamer Fear-Uncertainty-and-Doubt arguments which were indeed the competitive battleground between the Tories and UKIP at the last election but they are not the greatest concerns of the rest of the population. Huge areas of governance in which the EU plays a crucial role – of which environment is but one – have been simply left off the agenda of Remain. It could be a crucial piece of mis-targeting. I really have no idea who or what is running either campaign but my guess is that the underlying reason both fail to really connect with most of the British public is that their origins are deeply and narrowly political. The pro and anti EU arguments have been rehearsed many times in the halls and backrooms of Westminster but with very little exposure to the public. As such they are fine tuned in UK political terms but largely untried on most of the public except for the rightwing of the Conservative Party and UKIP. Now they have been dusted down and brought into the summer sunshine, turned into campaign propositions, amplified, exaggerated and repeated over and over but without becoming any more salient to most people’s lives and experiences. Both teams seem just to have transferred their House-of-Commons-shouting-match pantomime debates out into the real world, where they baffle and irritate the public, like neighbours forced to watch a bitter but obscure family spat which has spilled out into the street. Few of the arguments put to the public relate to individual realities. Few generate self-validating propositions which people can see or hear and test against their everyday experiences by thinking “was it like that for me ?” or “is that what I see or encounter ?” and coming up with a yes or no. So they have to rely on proxies to ‘explain’ what the arguments are really about and they are then faced with a forest of spinners. For many in the Leave camp, the EU Referendum is the political equivalent of ‘rapture’, for which they have waited for decades: ‘the end of the world ultimate grudge match’. The true believers now stagger about enthusiastically blinking in the sunshine, like zombies granted an unexpected early release from the grave. In contrast the Remain camp gives more the impression of directors from a firm of well-padded accountants, annoyingly interrupted in the middle of a rather good lunch by a shareholder revolt. Surprised that inertia has not entirely worked, they now reluctantly take to the stage and try to calm the waters by spraying anodyne reassurances almost entirely based on numbers but with very little zeal or enthusiasm. In truth the British public is now being told again and again that it is all important they take an active interest in an issue which for a generation has been largely ignored except for those at some thinly attended political fringe meetings. It’s a strange way to run a country.